The bionic eye that can restore sight Jump to media player A woman who has gradually been losing her sight for years has been describing the joys of being able to see again after being fitted with a bionic eye. Bionic hand boy 'youngest in world' Jump to media player A nine-year-old boy from Fife is the youngest person in the world to be fitted with a bionic hand. 'Bionic eye' trial volunteers wanted Jump to media player A Manchester hospital is looking for volunteers to be fitted with a "bionic eye". Finger on the pulse of bionic research Jump to media player Scientists at the University of Newcastle are using microchips as fine as human hair to produce a prosthetic hand. First Brit with bionic leg brace Jump to media player A man from London has become the first Briton to walk with the help of a bionic leg brace. Blind woman tests 'bionic' eye Jump to media player Blind Rhian Lewis, 49, from Cardiff, tests a "bionic" eye implant for the first time - but can she see what time it is? The man with the bionic hand Jump to media player BBC Inside Out reports on a medical breakthrough as a paralysed man is given his first bionic limb, fitted by a British prosthetics pioneer. 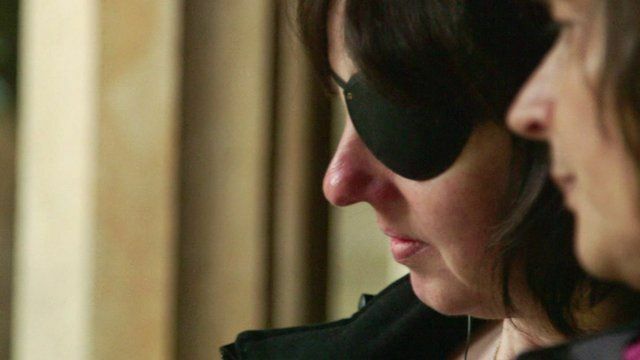 A woman who has gradually been losing her sight for years has been describing the joys of being able to see again after being fitted with a bionic eye. Rhian Lewis, from Cardiff, Wales, was given the retinal implant as part of a trial which could go on to benefit thousands of people suffering from sight loss. The 49-year-old had an operation to implant a tiny 3x3mm chip into her right eye.